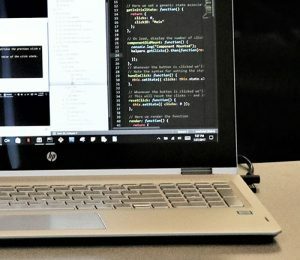 Coding is a fast-growing career track, and UCF Coding Boot Camp’s Full Stack Flex class teaches you the specialized skills to tap into this rewarding industry. Through a fast-paced, immersive curriculum, you’ll learn the skills needed to become proficient in front-end and back-end programming. Study at the pace that works for you, with both full-time (12-week) and part-time (24-week) options to choose from. Put your new coding skills into practice by building complex projects and applications that will bolster your professional portfolio. Receive a certificate of completion from UCF Division of Continuing Education, demonstrating your achievements. Benefit from a wide set of career services: resume and social media support, technical interview preparation, portfolio reviews, soft skills training, coaching, job matching, and more to help you launch or advance your career. As you embark on this 12- or 24-week journey, you’ll dive into a challenging curriculum and learn more than you thought was possible. 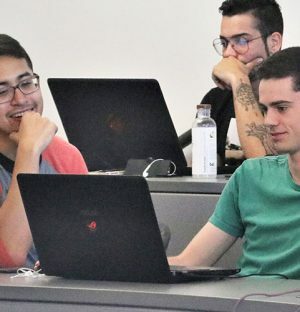 With an in-person classroom environment and collaboration with your classmates, you will get hands on experience in full-stack web development. Classes held two weekdays from 6:30 to 9:30 p.m. and Saturdays from 9 a.m. to 12:30 p.m. Contact an admissions advisor by filling out the form above if you’re ready to learn more about UCF Coding Boot Camp.